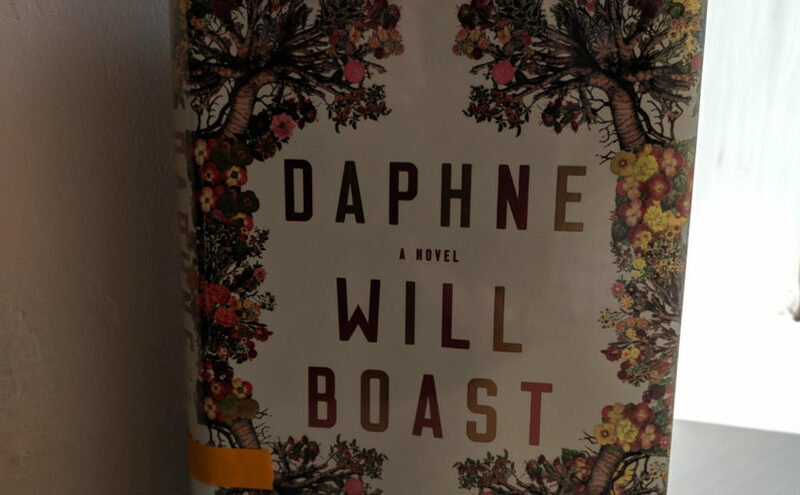 “Daphne” by Will Boast is the fight-or-flight of romance. What drew me to the book was the intricate and beautiful illustration of trees blooming flowers on the cover with a metallic shift. Upon bringing the book home from the library is when I finally cracked it open to see what I was in for. Immediately, I rolled my eyes at, “Daphne keeps her distance. As a teenager, her body began to betray her in peculiar ways.” I thought that it was another horribly cheesy teen romance, but what drew me in was the hinting at a rare medical condition affecting every aspect of Daphne’s life — any sort of emotion will paralyze her. By some strange coincidence, I had picked up a book about a rare psychiatric disorder which would of course catch my interest as a psychology major. Lucky me. Boast brings together the human psyche and traditional Greek mythology. In Greek mythology, Daphne is the personification of the laurel, a tree in which the leaves formed into garlands. The goddess Daphne turns into a tree to avoid the love of Apollo. This myth is manifested in the beautiful illustration on the cover and in the paralysis that Daphne faces when struck with any sort of emotion. Despite thinking that this was going to be yet another cliché teen novel, I was pleasantly surprised that this story was about a young woman in San Francisco, fighting between her heart and her head. When she was just thirteen years old, Daphne discovered her mysterious illness when she was overcome with emotion while reading a classic novel. Twenty years later, she has figured out a successful way to keep her self from becoming paralyzed by living on a strict schedule with very little socializing. She and her long-time friend Brook meet at the exact same place to catch up on life as to avoid any surprises. But when their hole-in-the-wall bar, The Pit Stop, is discovered by the hipster scene, Daphne’s life gets a little more difficult. She meets a shy gentleman named Ollie and when their hands touch, she nearly collapses. Any sort of emotion can cause her to shut down, which is why any change to her regimented schedule can mean life or death. Now she must decide whether she wants to stray from safety and give into her emotions, to finally live the life she has been reading about in novels. To do that means risking her life. Elegantly written, “Daphne” stole my attention. This time around, judging a book by its cover turned out in my favor.